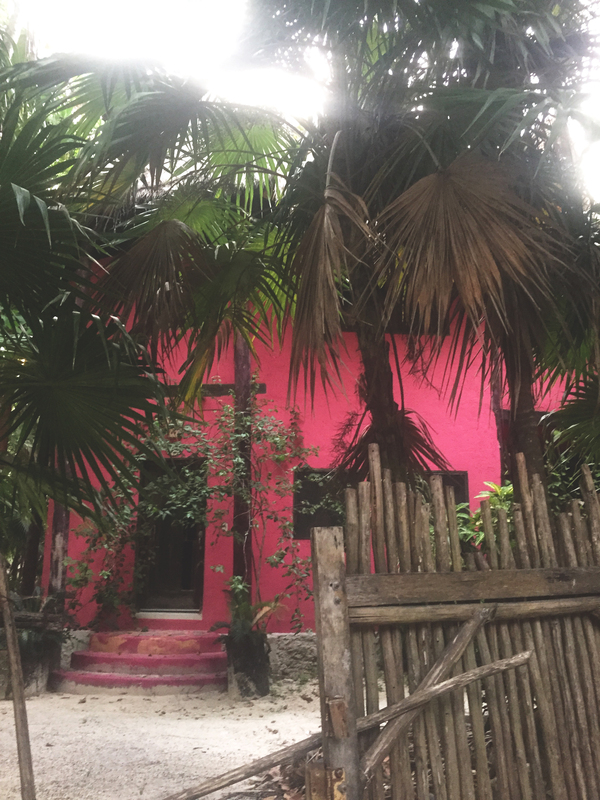 Tulum, Q.R., Mexico – if you haven’t read about it in the NYT or seen the instagrams or browsed the endless style blog recaps, then yay! 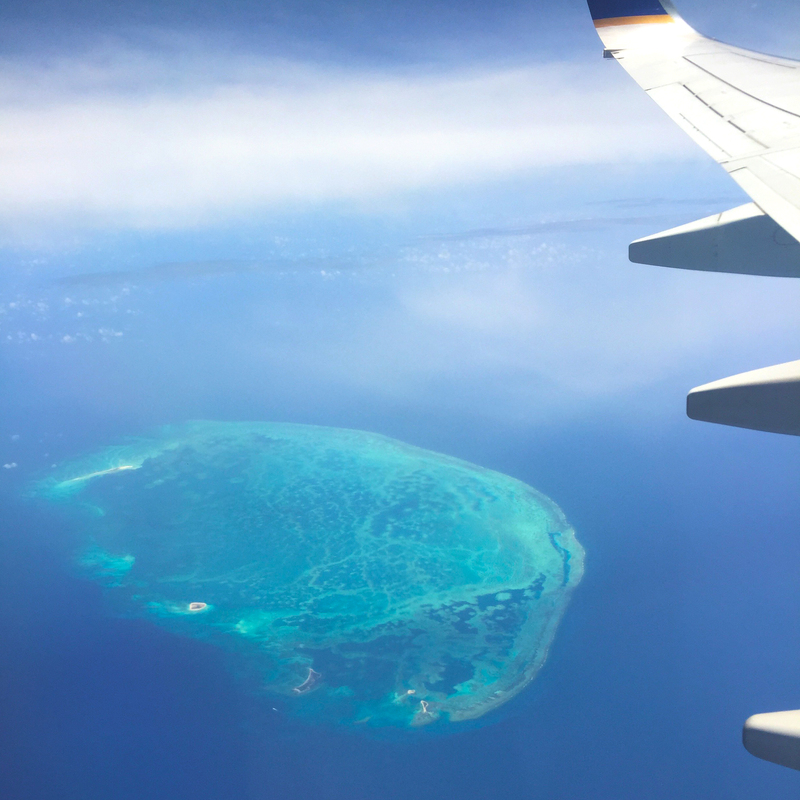 I’m introducing you to a beautiful travel destination and you can go ahead and read my travel guide. If you have heard of it and you’ve read about it and think you know all there is to know, then you should still read what I have to say because sh** is about to get super real. 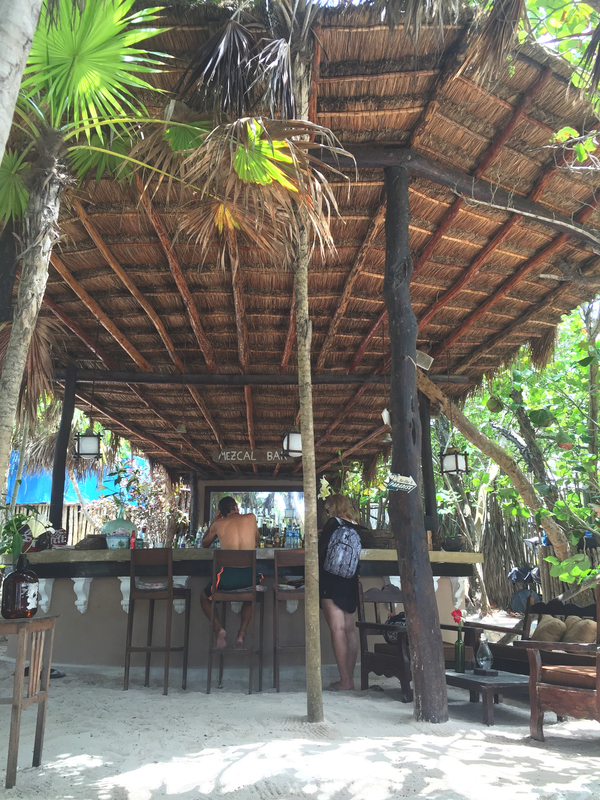 When I graduated from college, I wanted to take a solo trip off the grid; to connect to local culture and people, eat the local foods, learn a new language, explore the jungle, and see temples or ruins. 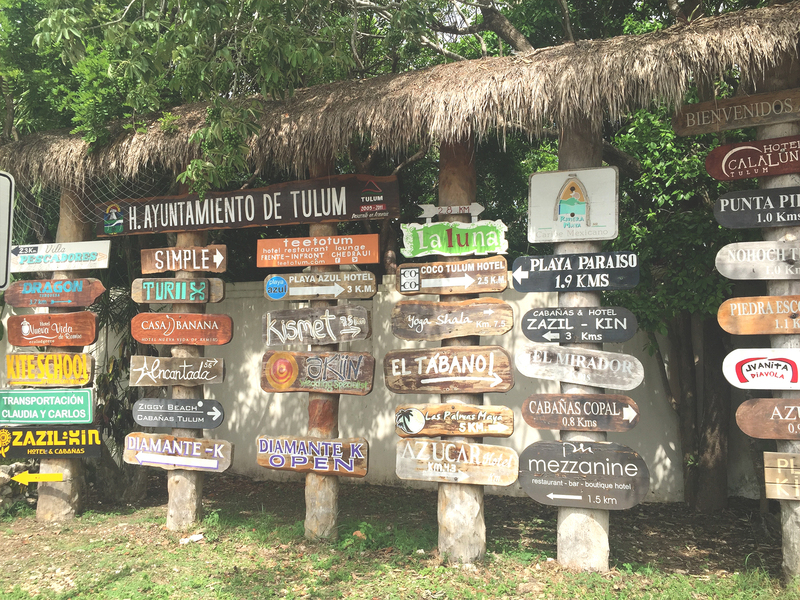 After doing about 30s of googling, I found Tulum. 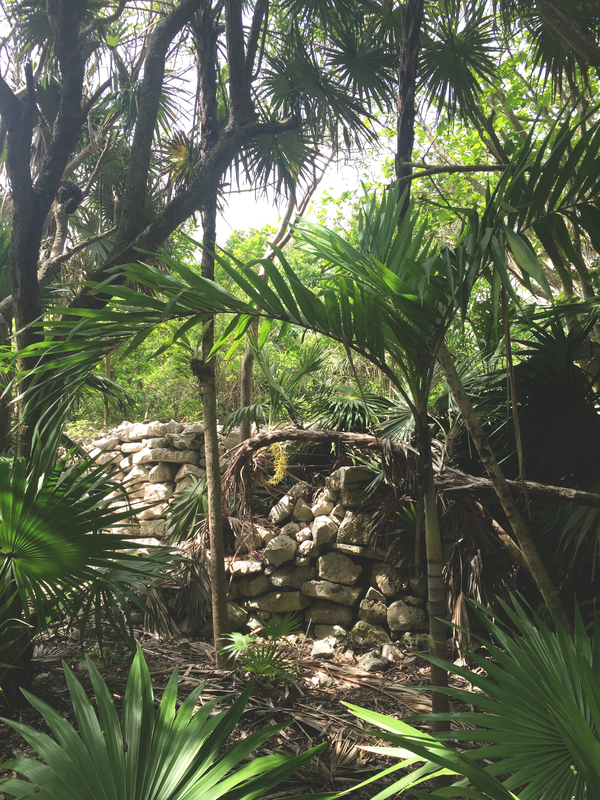 On the southern coast of the Yucatan peninsula, the Caribbean sea meets white sand and lush jungle; I read somewhere that this is where Mayan kings used to vacation… so like an ancient resort? Sounds like it could be legit, TBD. I’ve also read it was a port city/fortress. I didn’t study enough for this. 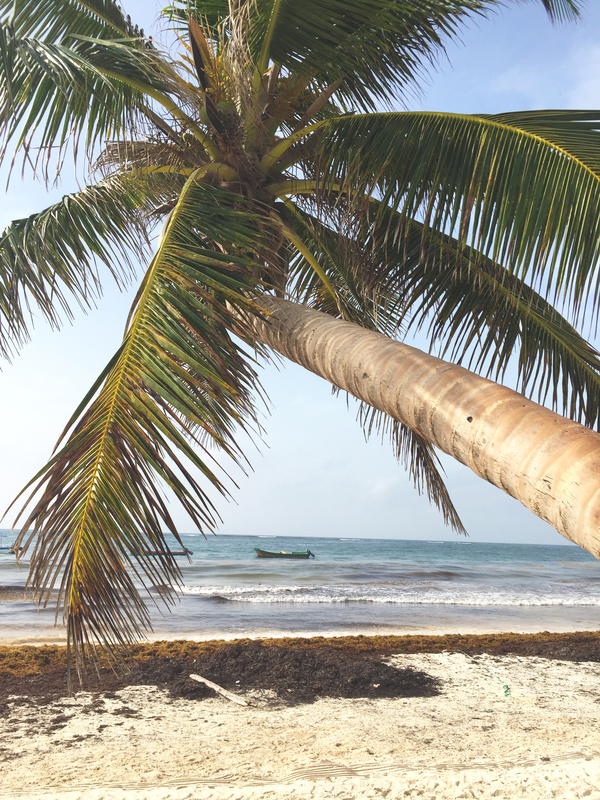 Regardless, walking through history along a Caribbean beach surrounded by jungle? sign me up. In recent years, it has become so popular, that I started to get nervous. 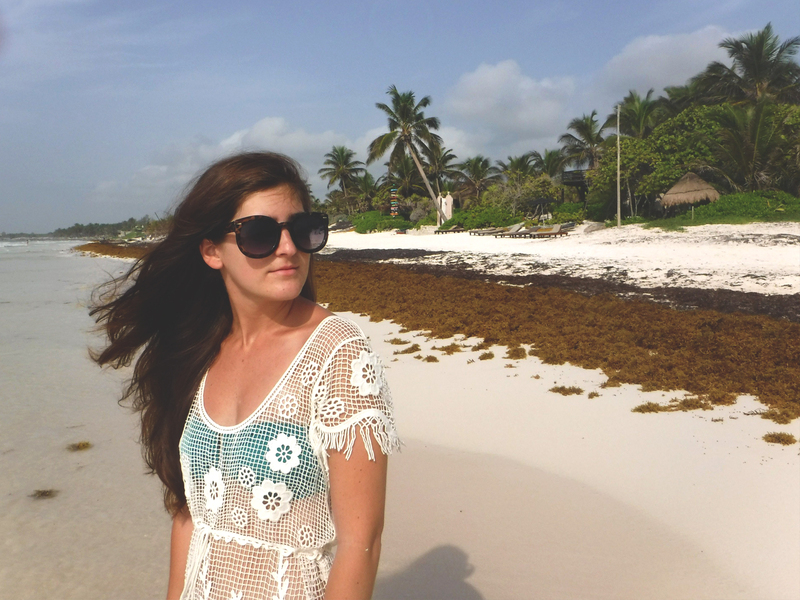 I saw Tulum was getting fancy and expensive and really…. touristy. I didn’t want a foofy resort experience, I didn’t want a posh tropical vacation; I wanted gritty, dirty, authentic, earthy. I wanted an adventure. And I figured I had to get in before it became more popular (and priced itself out of my range). Boy did I get an adventure… so much was out of my comfort zone, all at once, that I’m surprised I didn’t have a full-blown panic attack. Super glad my mom forbid her adult daughter to travel alone to Mexico (this time), especially given the unforeseen circumstances. It was the most learning I’ve done in a short period of time, ever – about myself, culture, people, geography, climate, nature, etc. In order to not have a cluster f of an experience and simply enjoy a relaxing and invigorating vacation, please follow the guide below. 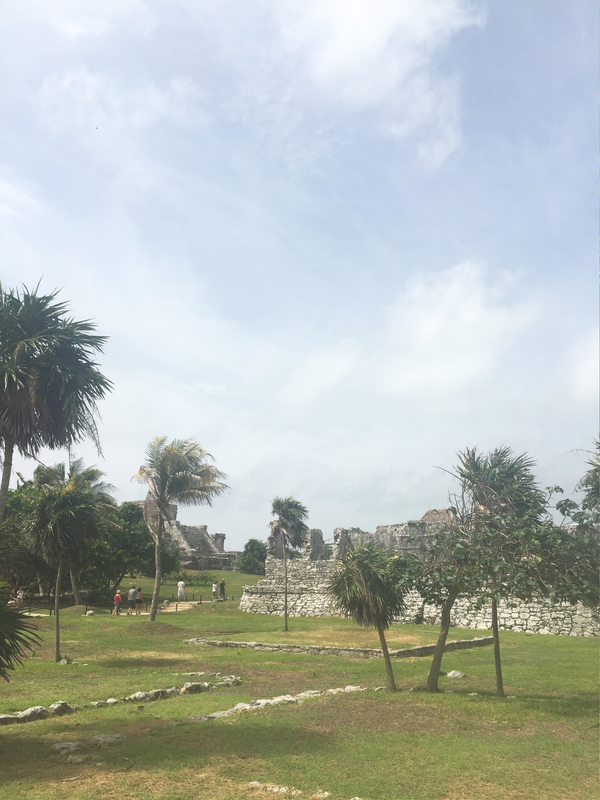 Tulum is hot AF. You’re in the caribbean, in the jungle. It’s humid, it’s hot, and there are bugs. You have been warned. The online map does not match printed maps you can find in town, there aren’t street signs, addresses aren’t a thing, no one knows how to give directions, and some places listed on Trip Advisor don’t exist in the location that is listed online. It is absolutely perplexing. I even learned how to ask for directions in various ways in Spanish, to no avail. Try to map things out ahead of time, if you can confirm their location. Don’t bother asking for directions. 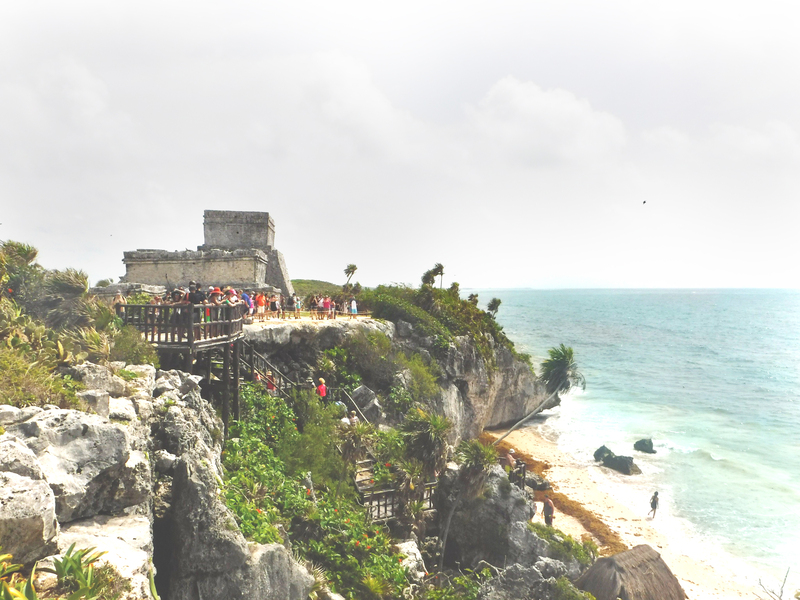 There are two parts to Tulum. Read about that here. There is a ginormous supermarket if you’d like to buy bottled water and snacks in bulk. I regret not doing this. It is called Chedraui, and I think it’s a combo of Costco, Walmart and a grocery store. Someone may throw an iguana on you and ask for money. Beware. Don’t bring nice clothes that you’re going to end up destroying via your own sweat/the environment around you. Pack clothes that are easy to wash, nothing dry clean, and nothing you’d be devastated losing. The dollar is super strong, I advise bringing as many pesos as possible. Change your money ahead of time at your bank by making an appointment in advance, so you don’t pay high fees. Not many places accept credit cards. If you don’t speak español, I’d highly recommend bringing a pocket translator or ensuring your phone plan is international (for Google Translate). Practice practice practice, and try to use it as best you can; the local people will appreciate it. bug spray is not a suggestion, it is mandatory. do not take this lightly. mosquitos don’t play. 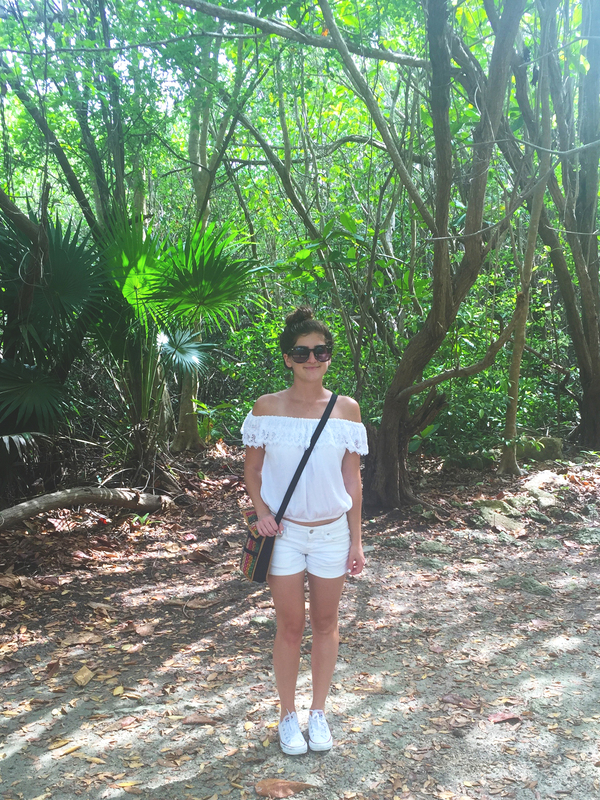 anything white will become brown thanks to sweat, sunscreen, bug spray and dirt. My white shorts are now yellow. Thankfully they’re from target. One of the exceptions to the packing rules – a nice, white thing: the white dress you’ll see in a few photos (including below). It’s a swim cover up from DESPI. The bottom is a bikini material, stretchy, lightweight and quick-drying. The top is lace. 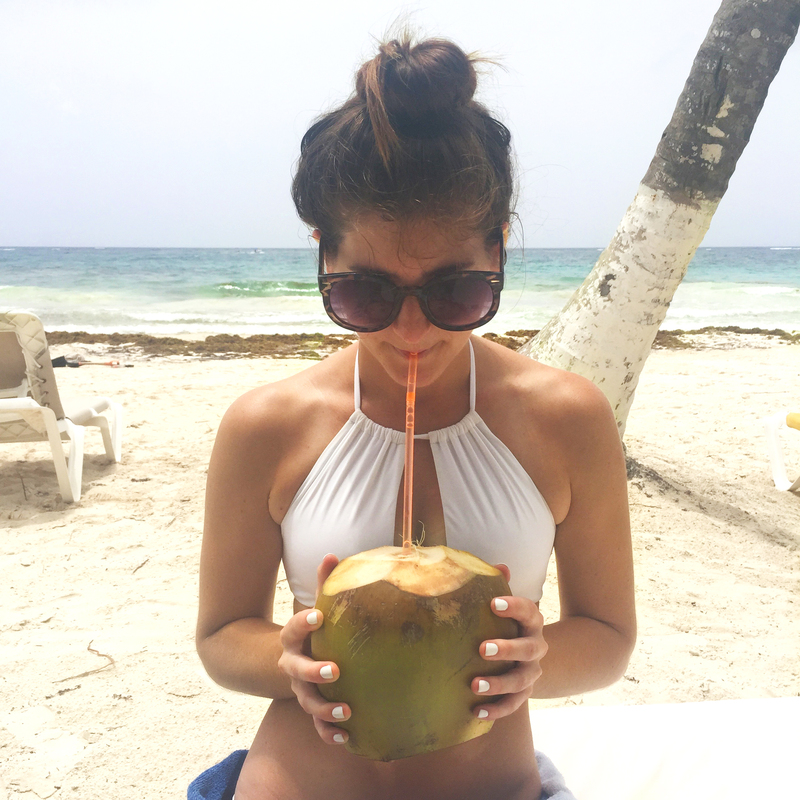 It was perfect to throw on over my bikini and go straight to dinner. I love pieces that are multifunctional, and this was a great piece to have while traveling as it worked for so many activities. 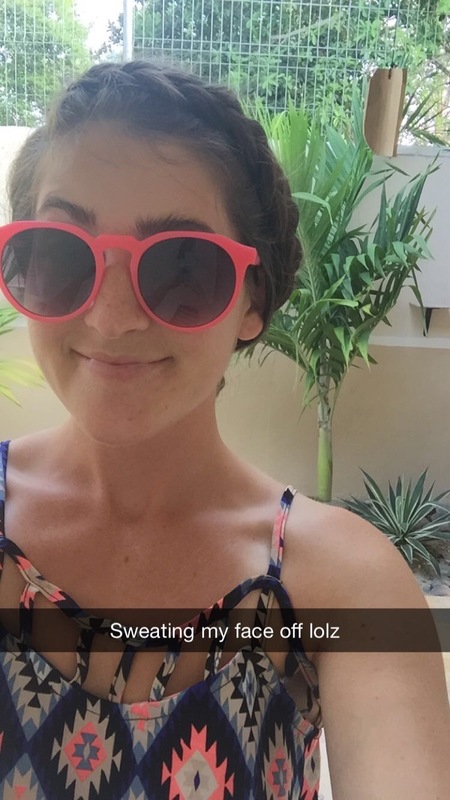 Suggestion: I got my legs waxed prior to the trip so I wouldn’t have to shave. HIGHLY recommend. 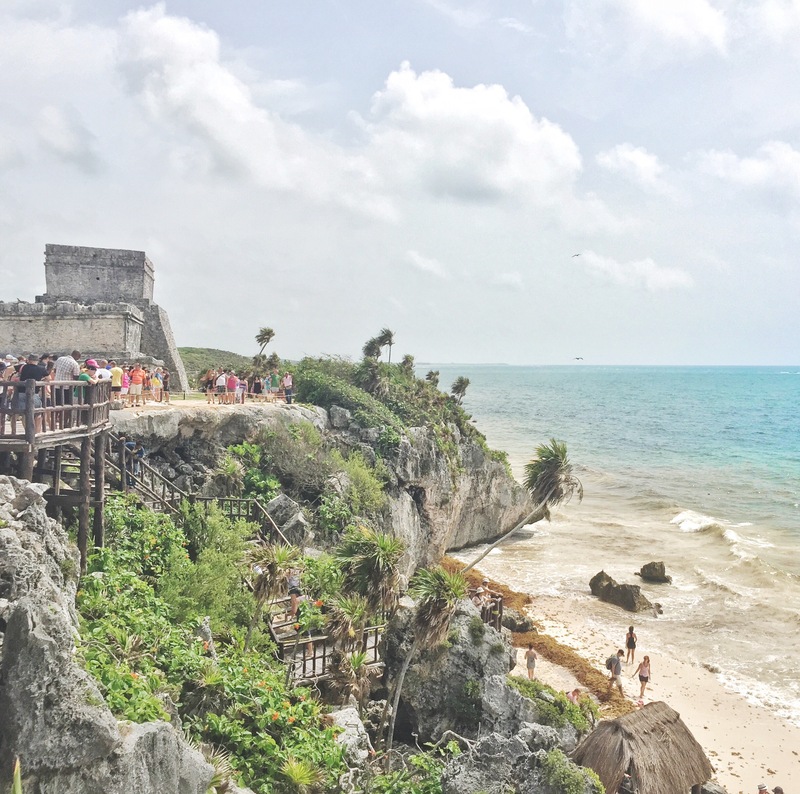 You do not want to be shaving in the combination of potentially-contaminated water, sweat, salt water, cenote water, aggressive bug spray and sun screen. It is asking to ravage your pores everywhere. Take heed and just get a wax, you will thank me. It is well worth the couple weeks of growing it out in advance. TRUST. We flew LAX to CUN, got off, asked for directions to ADO (the bus) – it was right outside customs, very easy to find. The bus was about $6/person, air conditioned and comfortable (we watched Thor in Spanish, so that was fun). 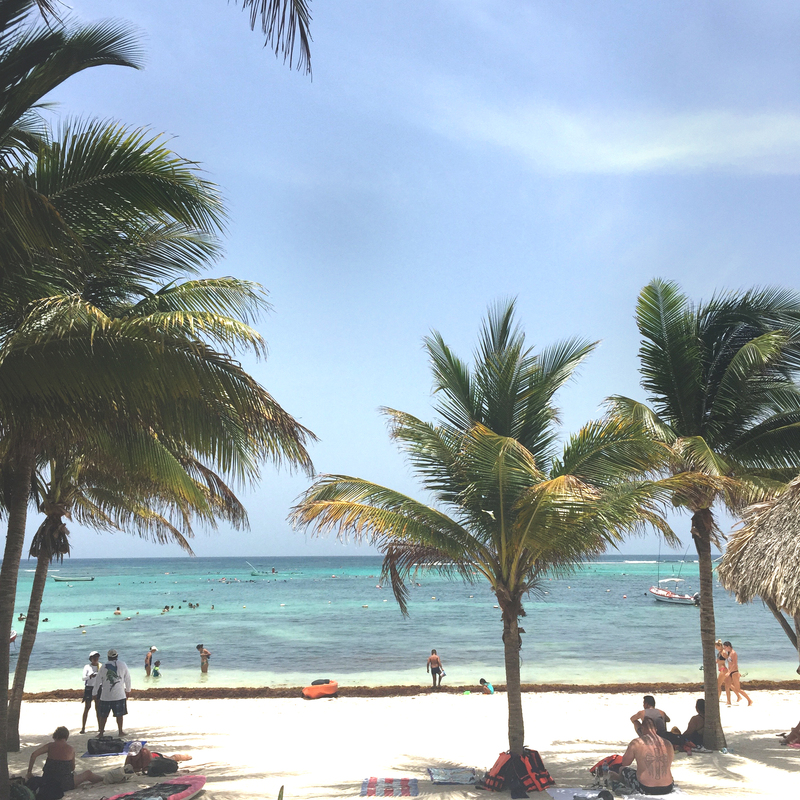 It went from CUN to Playa Del Carmen, we got off and got on the next bus to Tulum. It dropped us off in town, where our Airbnb host met us and took us to the apartment. The bus goes back to the airport, but we ended up renting a car… more on that later. We used “America” Rent a Car, but I wouldn’t recommend. Taxis and collectivos are a dime a dozen, but if you’re renting a car, I’d stick to something like an Avis or Hertz. Our car did not have air bags or a working seatbelt on the passenger side, so that made for a super fun and relaxing trip to Chichen Itza, sans any fears. As I mentioned before, I booked an Airbnb that ended up being far from the resort area. Although I was not looking for a resort, I would have preferred to stay down in that zone. That said, our Airbnb hosts were delightful, and the apartment itself was clean, nice, renovated and air conditioned. 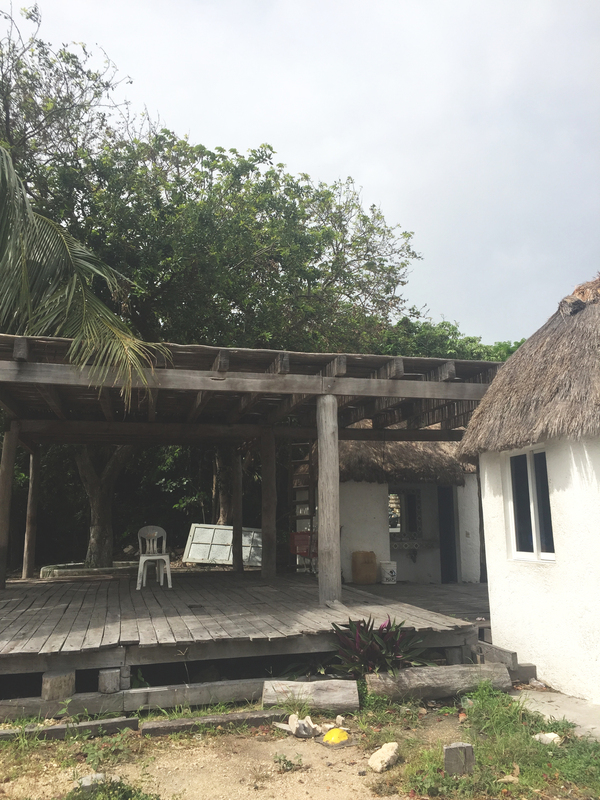 Check out Casa Tortuga if you’re trying to stay in that area. 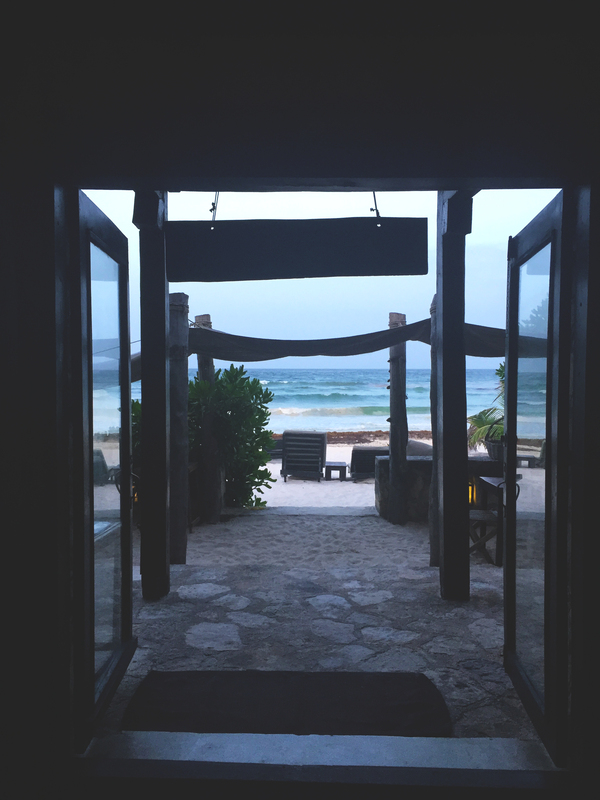 On the third night, we stayed at Playa Esperanza. 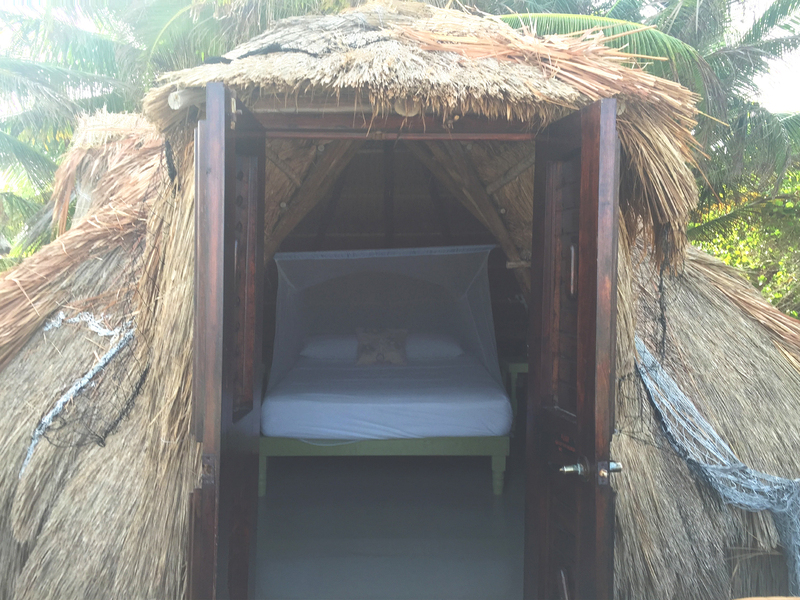 It’s a gorgeous eco-“resort” on the sand; we stayed in a grass cabana that opened up to the ocean. It’s not how you’d traditionally think of a resort: it does not have AC, nor electricity (aside from 6pm to approx 1am), but if you’re there in a cooler season, it’s probably delightful. We, however, were not so lucky, and basically sweated to death (in combination with a pretty savage stomach bug). It was still beautiful, and I’d definitely recommend it, especially for the price!! When we stayed in town, we found a couple cute places to get some real Mexican food (including some of the best tacos and THE best smoothie I’ve ever had). 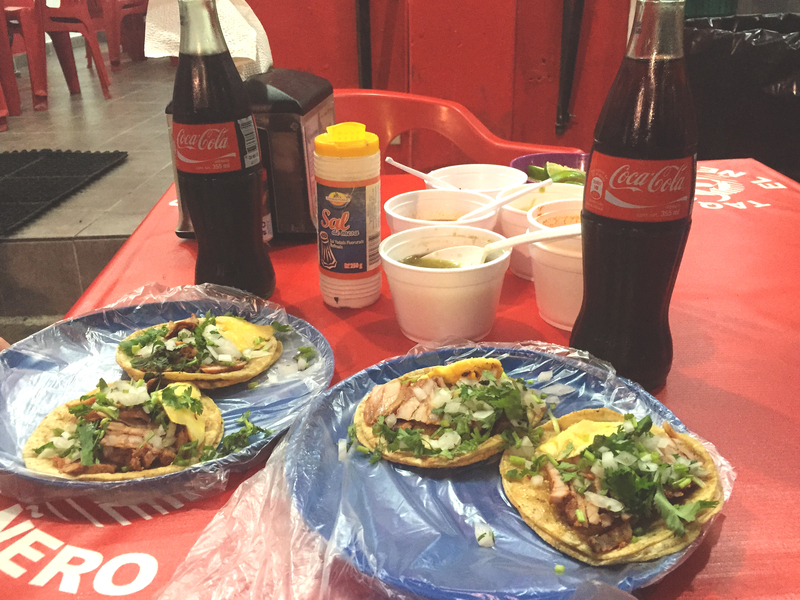 Taquerias El Ñero isn’t anywhere online (not surprising) But it’s on the main road next to ADO and the place that may have given me a disease, La Chipaneca (I cannot endorse their tamales because of said mystery-illness). It’s red and white, and has insane pork tacos with pineapple and jalapeño. Naturall is a healthy breakfast place, a few doors west of ADO. We got chilaquiles, fresh squeezed orange juice and the most amazing mango smoothie. It was velvety and smooth and delicious. I want one so badly right now. That’s pretty much all we did in town – sleep and eat. Our Airbnb had bicycles, which were nice for cruising around town and evading stray dogs that chased me. 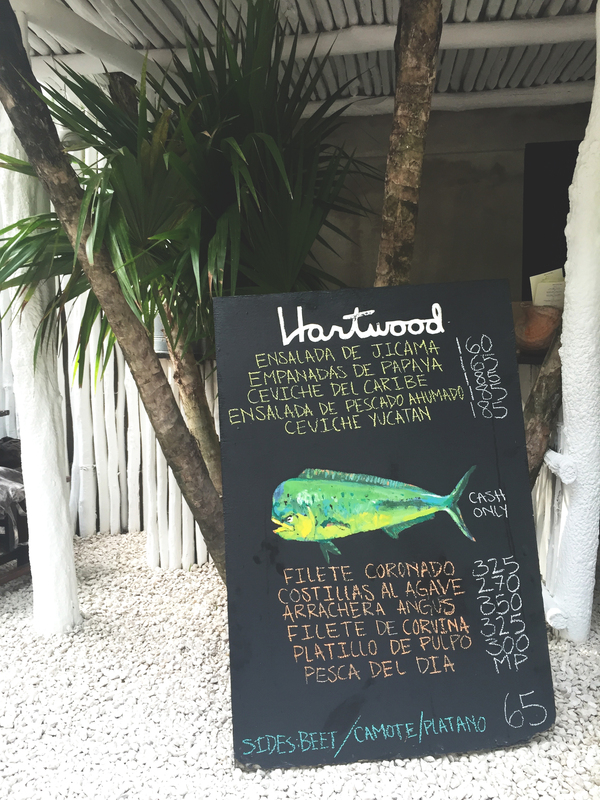 Ah, Hartwood. Where to start with such a magical place? 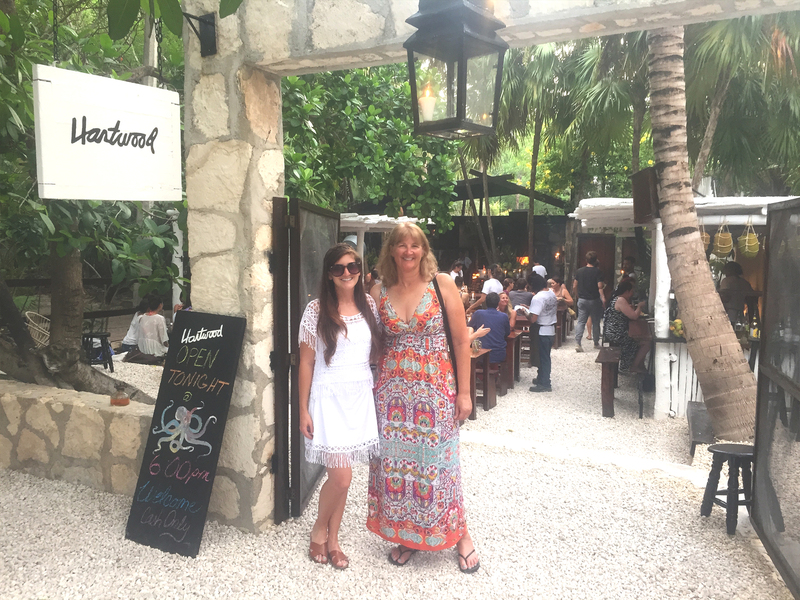 Let me begin by saying that I did not want a posh Tulum experience, but I couldn’t help myself. 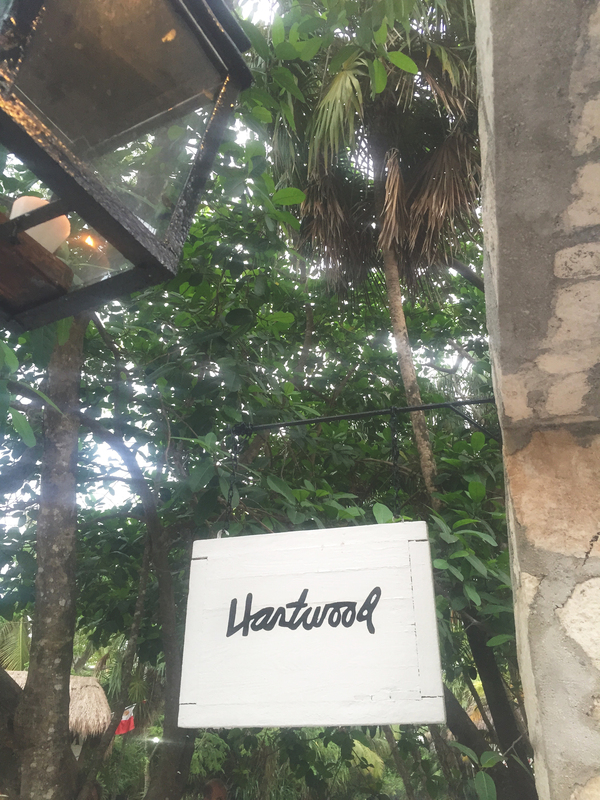 This place is just so enchanting and even our Airbnb host told us that we MUST try Hartwood. 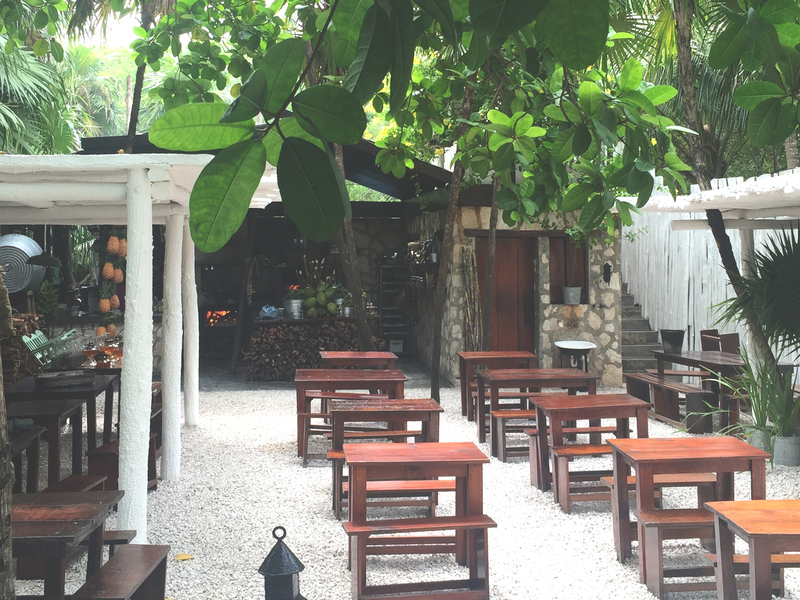 I was so apprehensive given the hype, the white-ness, and the presumed pretension that comes with ‘a posh jungle restaurant in the Caribbean started by two ex-pat New Yorkers sourcing local foods cooked in an open kitchen.’ Yeah. All that. I feel like I kind of wanted to hate Hartwood. You walk in and immediately feel like you’re in a Madewell summer catalog (most likely because you are), but shortly thereafter you’re treated to an unforgettable meal. 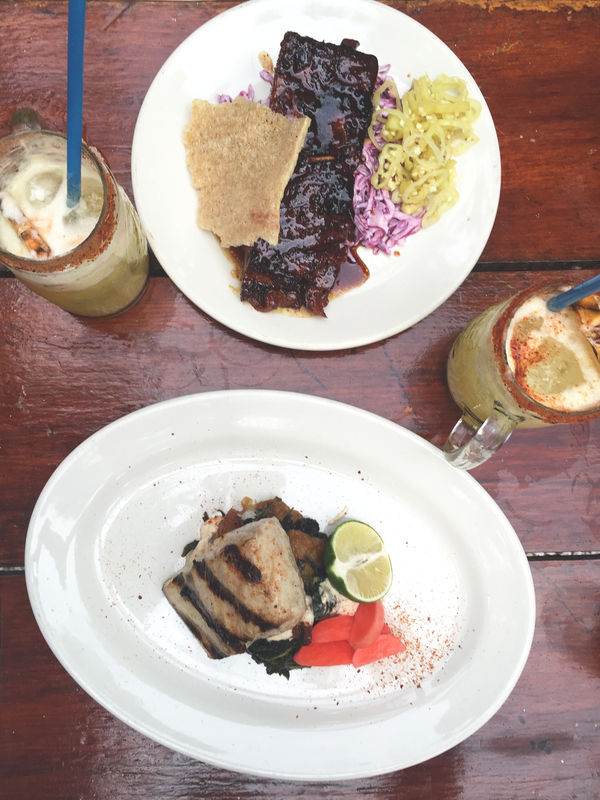 – Reservations are made in-person only, beginning at 3pm. I know, it sounds silly. Stupid, even. But that’s how it works for them, and it allows them to keep a good control over the flow and the tranquil ambiance of the restaurant, bettering the diner’s experience. Do I have a marketing job yet? Anyway, where was I? Oh yes, 3pm… Arrive at 2:30 and get in a queue. It won’t take long, and you’ll guarantee yourself a spot. They book up quite quickly, so just listen to my advice and get there around 2:30 to make a reservation. 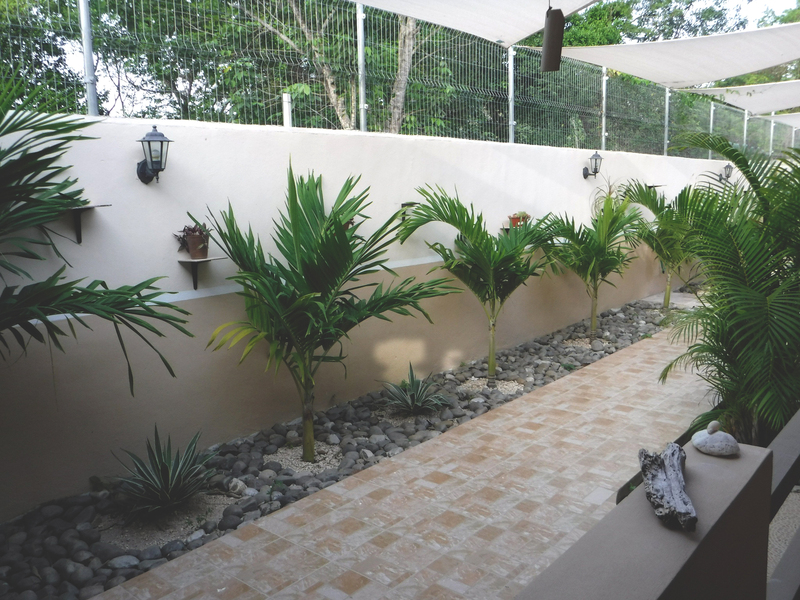 Bring a drink, hang out in the shade, relax. – Order the coronado filet, or the pork ribs. IN. SANE. We also got a jicama salad and fresh piña habañero margaritas. 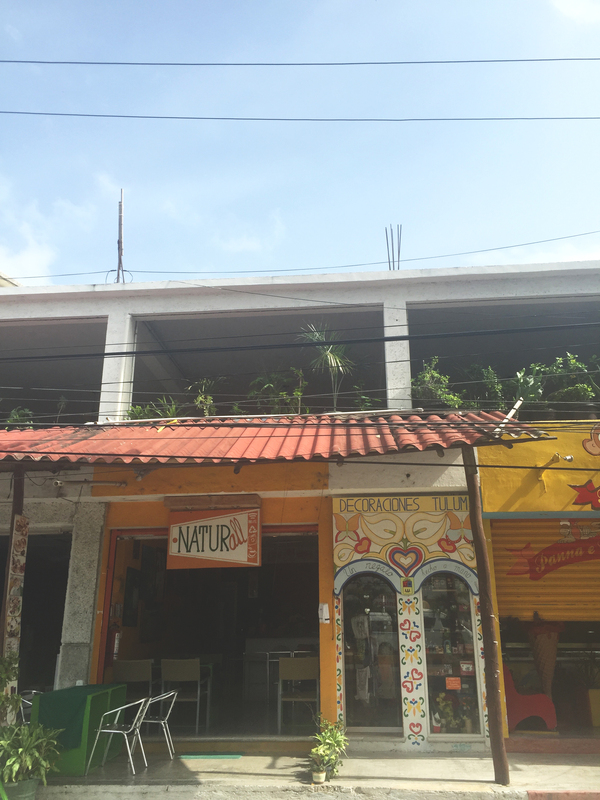 – Bring cash – pesos, preferably – they do not accept credit cards and you’ll get a better deal if you pay in pesos. 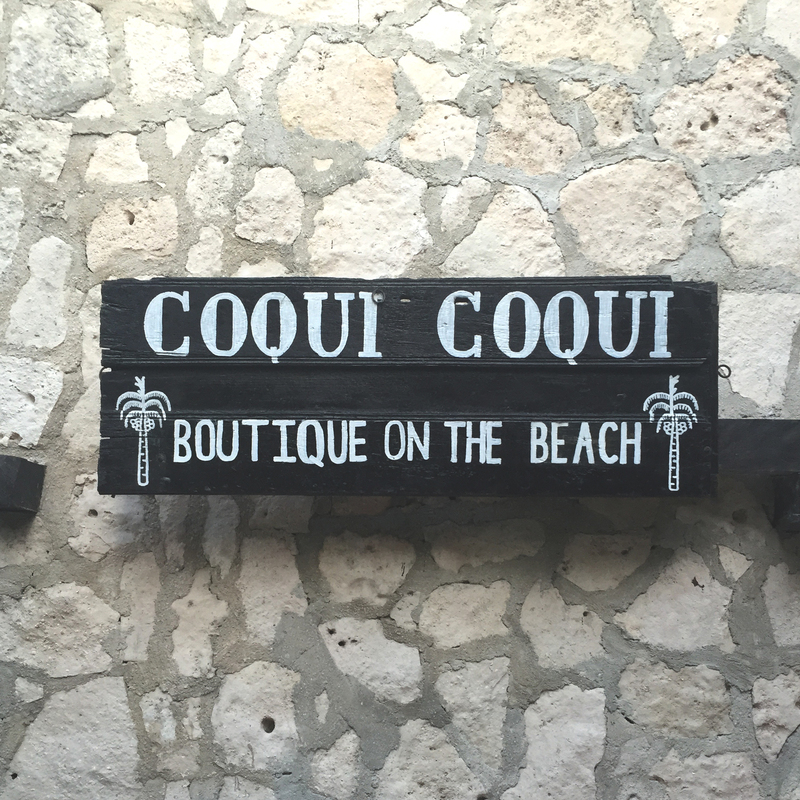 Another one of those ‘I-had-to-try-it’ places: Coqui Coqui is a well-known parfumerie and boutique hotel with a nice little restaurant on the sand. It has been called “stupid pretty” by Conde Nast, and I have to echo the sentiment. 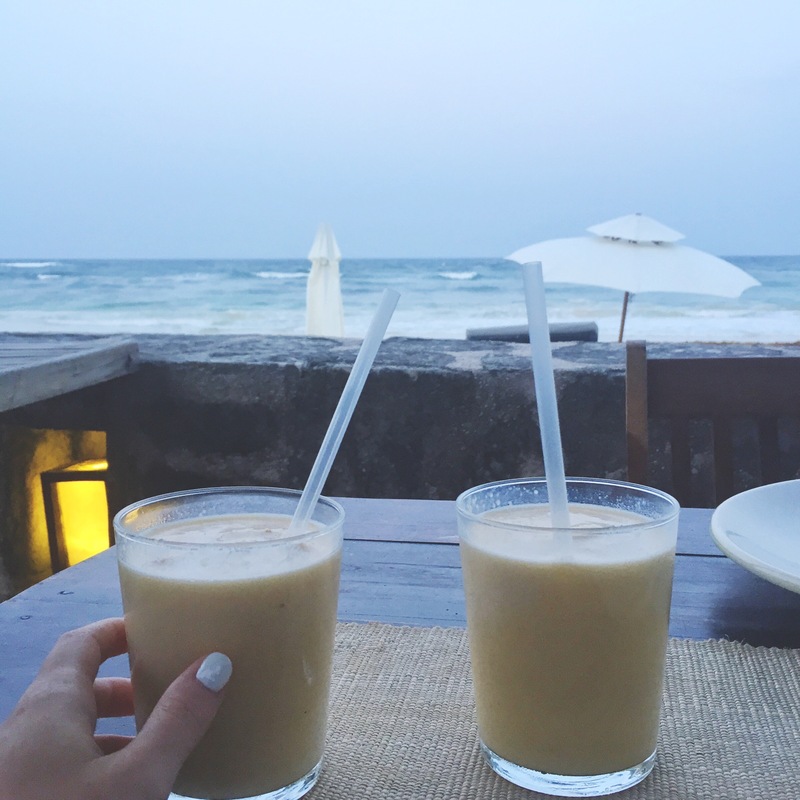 We came to the restaurant at dusk in search of a smoothie, and we were not disappointed. 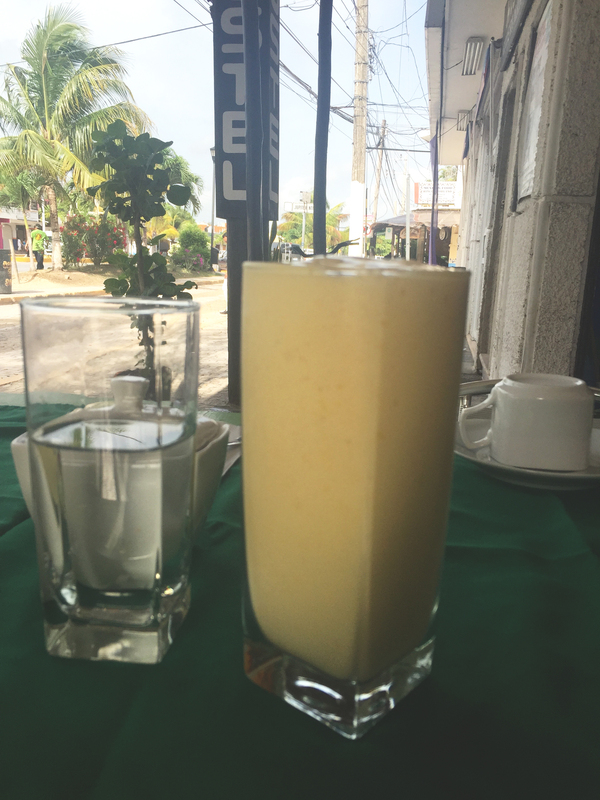 The Axchitlatlan shake – coconut cream, mango, pineapple, and yogurt – was about 140 pesos (a little under $9) and seriously fresh. The ambiance was magical, and it smells beautiful thanks to the diffusers and candles from the parfumerie. If we had been feeling better and had more of an appetite, we would’ve tried the rest of their menu, which is mostly ceviches and salads (looked super yummy). Alas, Montezuma got more than revenge on us. Like I said, there are no addresses, and I’m not even sure if this place has a name. I cannot for the life of me find any information on it on the internet, but I have photos! I have proof! It’s near Yoga Shala… walk north from Hartwood (suggestion, just go after eating at Hartwood), and it’s on the left side. The storefront is made from old VW hoods and parts, it’s actually super cool. It’s tucked a little bit away from the road, so keep your eyes peeled. 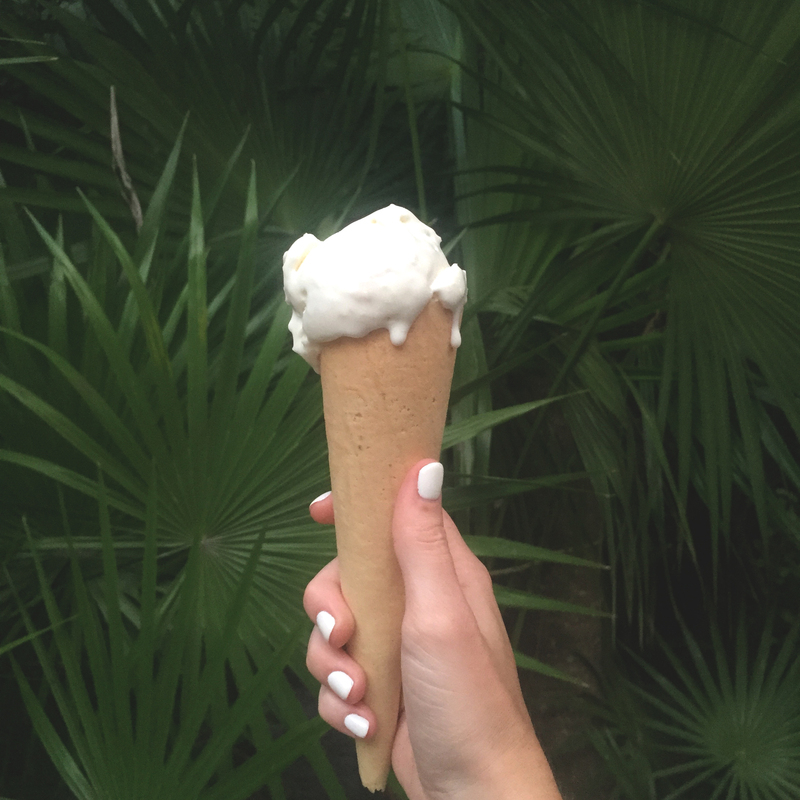 The coconut gelato is absolutely life changing. [update: google maps has not updated the map in that area since Jan 2013. That’s comforting]. 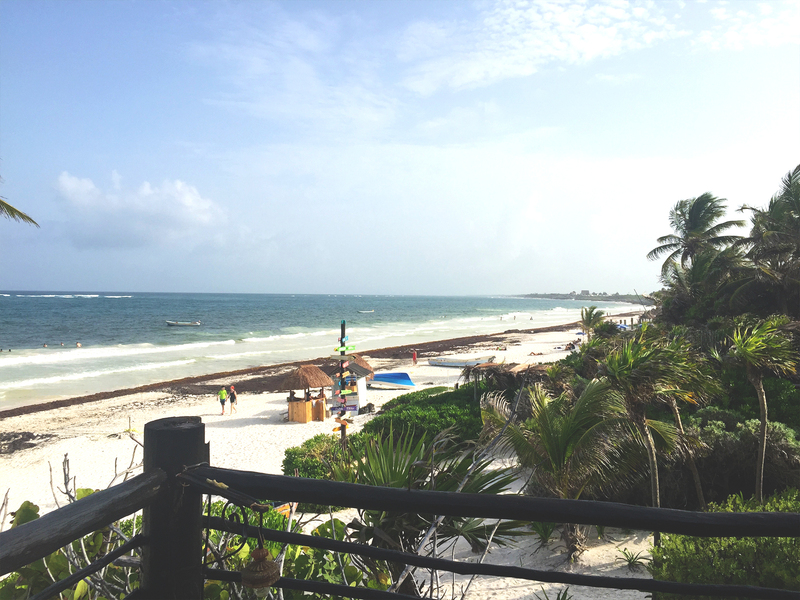 Named as one of the best beaches in Tulum, Playa Paraiso is just south of the Tulum ruins, and just north of the main stretch of resorts and restaurants. 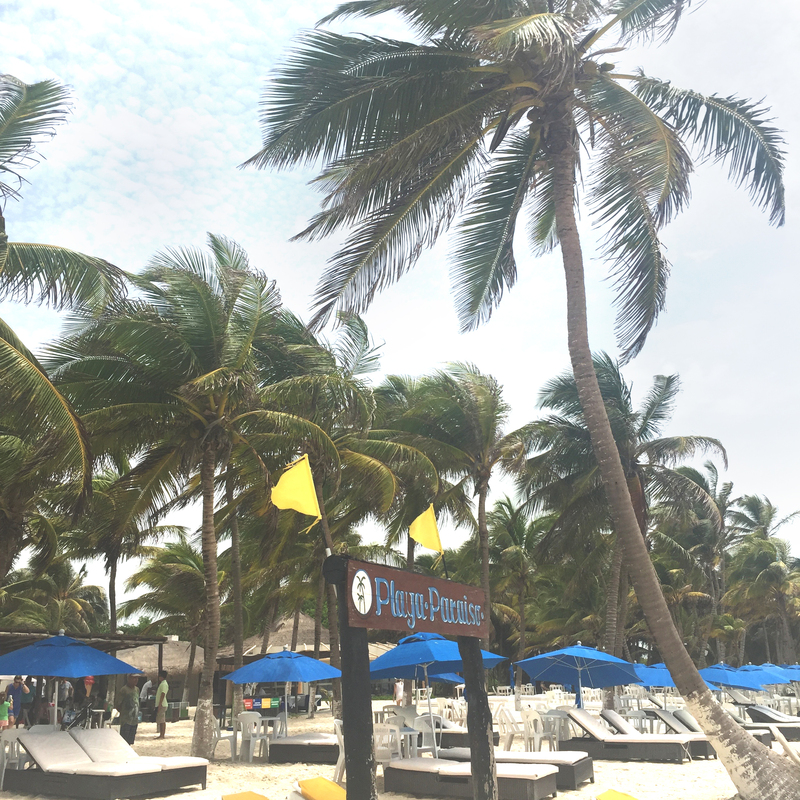 With a picturesque slanted palm tree, white sands, lounge chairs and umbrellas for rent (for a little over $2), and waiters bringing you some of the best piña coladas of all time, I can see where it gets such accolades. 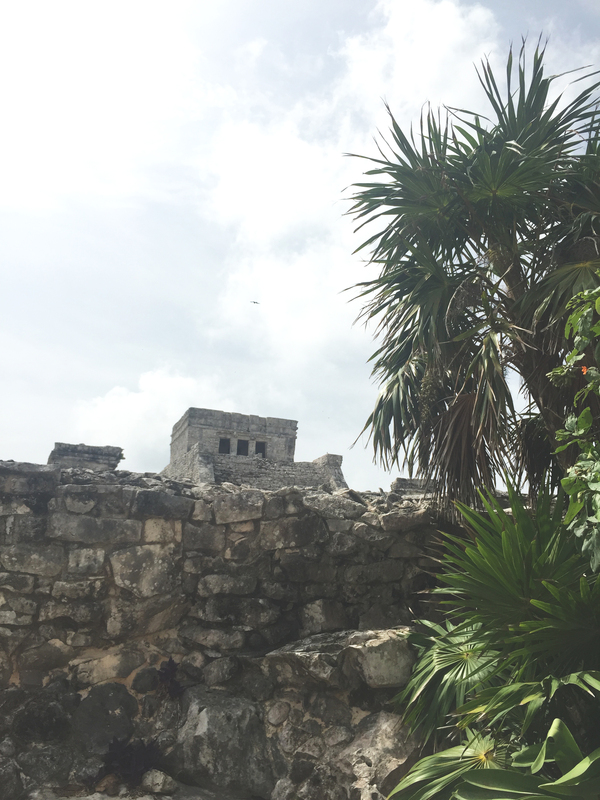 During the first day of our visit, I could hardly wait to see the Tulum ruins… and it turns out I wasn’t being annoying, my overexcitement was justified (FOR ONCE). It was one of the coolest experiences I’ve had in my whole life. Indescribable. As with anything touristy, go early. They open at 8a.m. ; go then to beat the heat and the crowds. 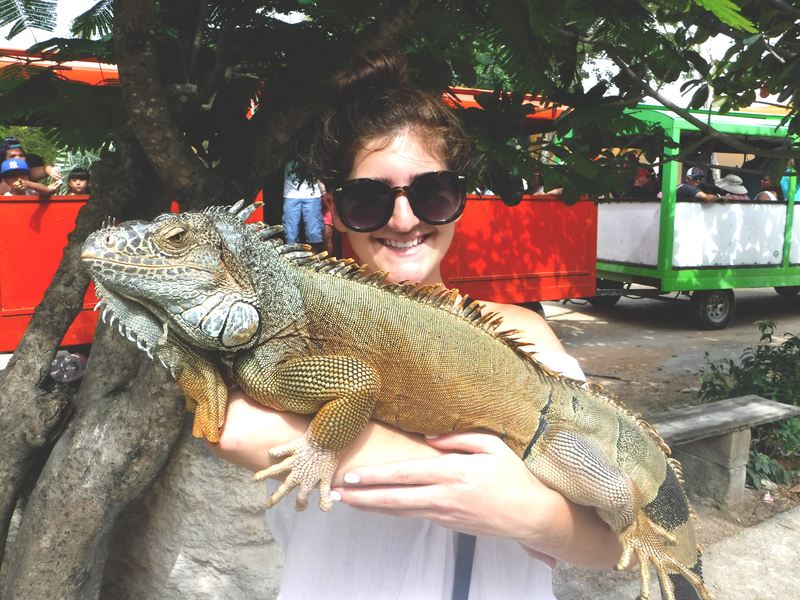 There are tons of iguanas roaming around, and you feel like you’re in line for the Indiana Jones ride at Disneyland trekking through the jungle except IT’S REAL LIFE HOW COOL IS THAT. Also it rained a lot at night when we were here, so the water is murkier and doesn’t look as pretty as it does on the internet. We got there by taxi, which was inexpensive from the town. They try to sell you a lot of tour/snorkel/guided adventure packages at the front entrance, which may actually be beneficial, but we were ballin on a budget so said no gracias to several propositions. You’ll find a place that says Taquillas (not tequillas) which means ‘tickets,’ and entry is somewhere around $4 per person. 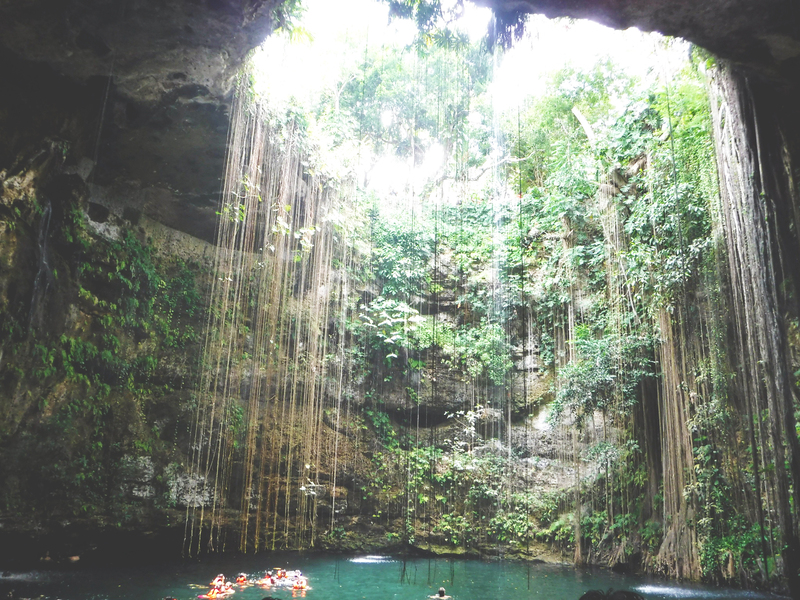 There is a cenote nearby that we wanted to try, but we got sick before we could go back. 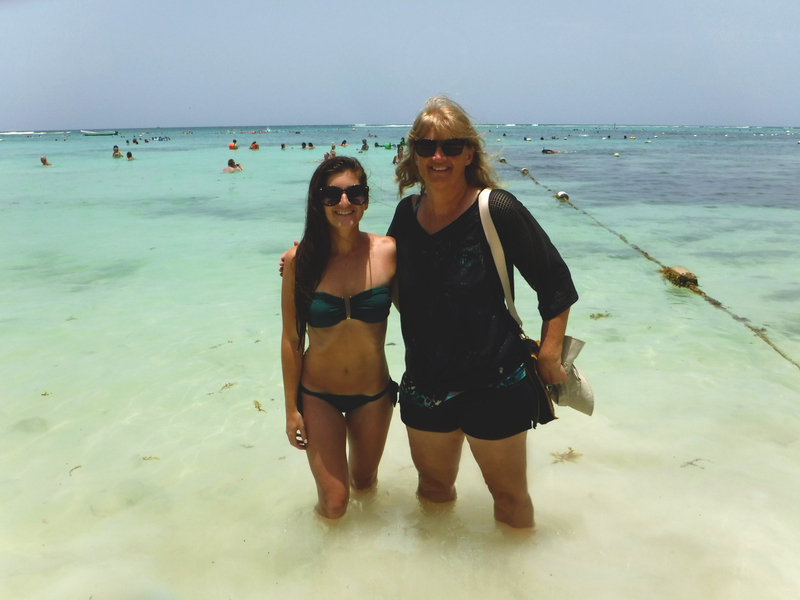 I need to come back to Akumal. Got too sick to play with the sea turtles, but I needed to get in the water for just a minute. The ocean here is stunning. I wish I could go back next weekend and just hang with the turtles. 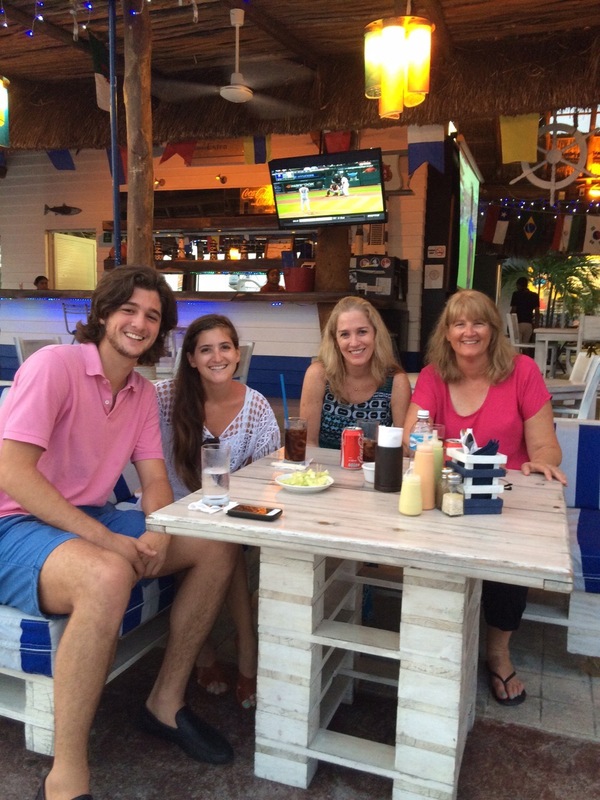 As it turns out, I have second cousins in Cancun, and they’ve got an awesome little restaurant overlooking the lagoon at La Isla mall. 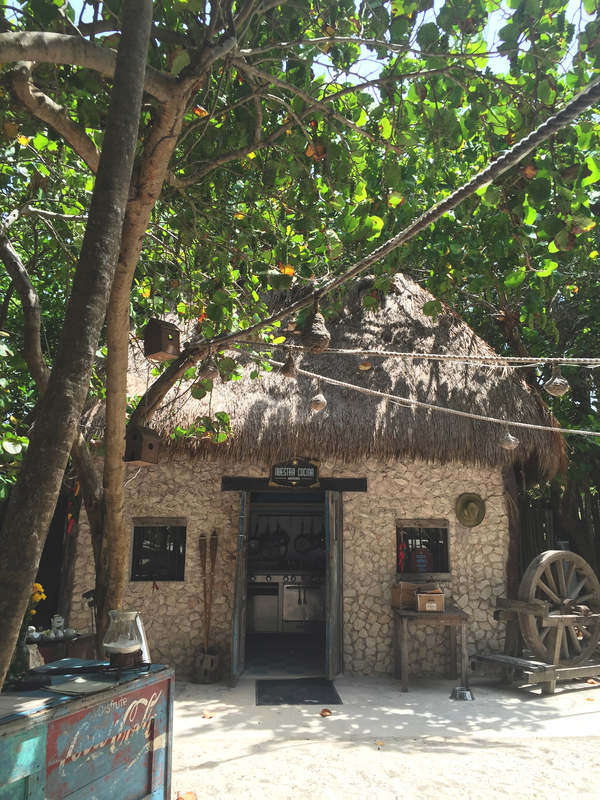 If you’re on your way back to Cancun, or just visiting Cancun in general, stop by my family’s restaurant, Lighthouse for coconut shrimp with mango sauce, and a ton of other fresh seafood. I can’t wait to go back and visit my cousins, who were so sweet to help me with my Spanish (and took care of us when we were sick… like, nice to meet you, I have diarrhea, but do you want to hang out anyway? sorry tmi). my cousin Emiliano is 19 and he is 6’4″. Do we look related? And that’s my mom’s cousin Cristina in the middle. We stayed in Cancun the night before our flight (which was obscenely early – note to self/everyone else: don’t book an international flight early in the morning, no matter how cheap it is, because you’ll forget you have to give yourself a three-hour buffer for customs. yay). 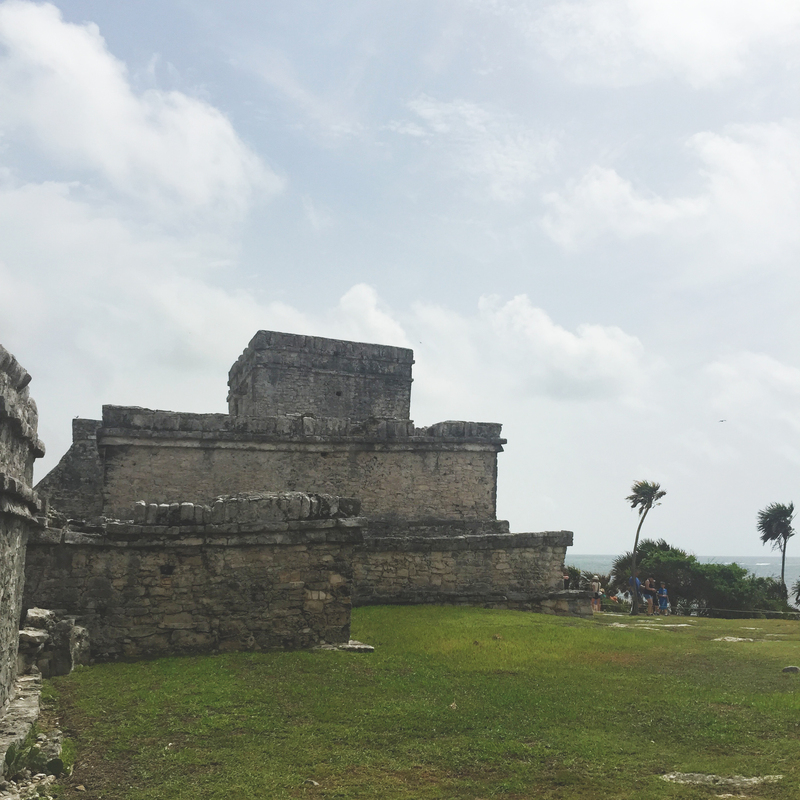 So that’s the gist of our time in Tulum; we had a big day in Chichen Itza and Valladolid that I’ll detail in the coming posts. 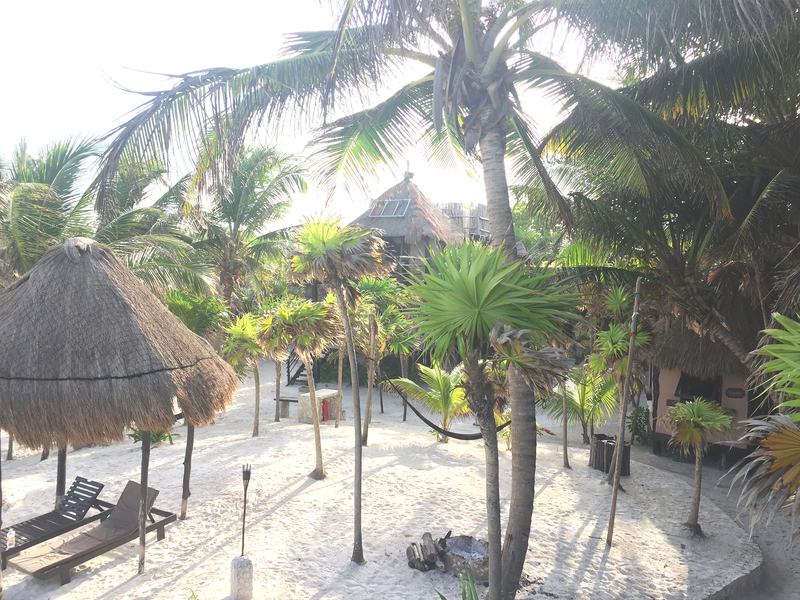 I hope I covered all the must-knows and must-dos of Tulum, and if I didn’t, feel free to punch me in the head/yell at me via the comments section.